I’m back to red again this year having made bright red in 2013 and burn-out white in 2014, I opted for maroon this year. It’s the same Ditto Fabric jersey used for a Renfrew and for leggings so I got 3 garments from 3 meters and I really should learn to buy just 1 or 2 meters in future. There isn’t much to add to my previous comments about the pattern and I didn’t make further alterations. I did however, dabble with an alternative stabiliser for the shoulder seams. Lacking twill tape, organza ribbon and clear elastic (I have previously used all three to successfully stabilise shoulder seams – my preference being organza ribbon) I tested the possibility of fold-over-elastic (FOE). Have I just lost your sewing respect with that admission? Well, let me defend myself. It’s flexible like organza ribbon, has the same elastic return as clear elastic and is thinner than twill tape. I was careful to line it up against the cutting blade of my overlocker so that no FOE was cut, just jersey. 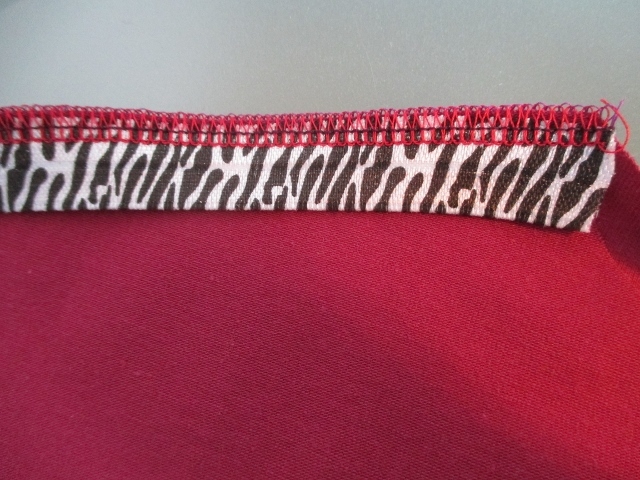 Lengthwise, I cut it slightly too short so that folding over the sleeve edges to finish them was easy with just a single layer of FOE and it’s zebra print! Me… conservative me, matching facings me in a shock contrast notions scandal! On to the other half of this outfit. 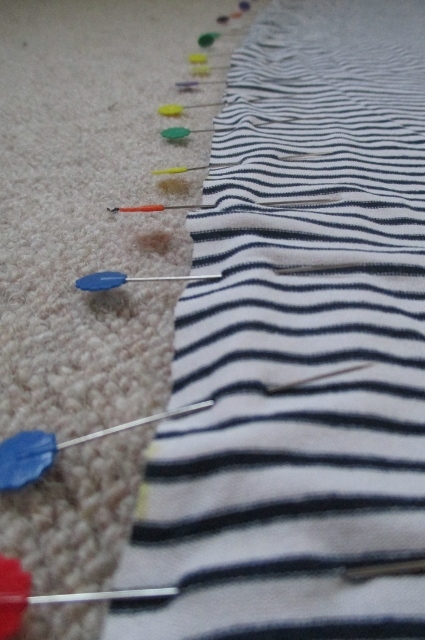 Do you recognise this fabric from my recent top ten tips post? I’m really into navy stripe fabric at the moment and ‘needed’ another maxi skirt! I used my self-drafted maxi skirt pattern (previously used here and here) and pinned matched stripes a lot! 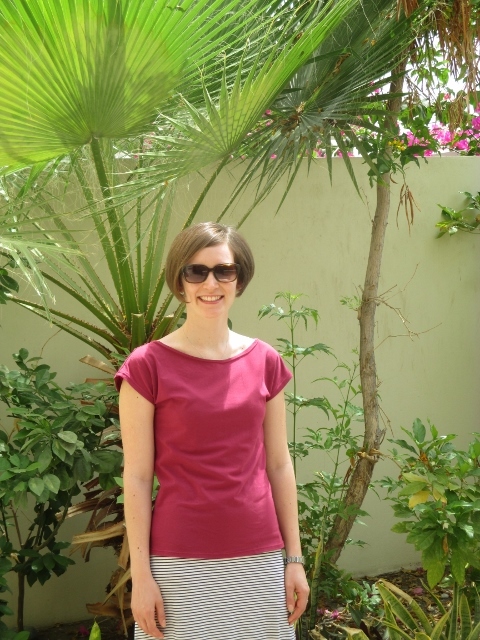 A bit of a jersey fabric overdose but a ‘quick to sew’ outfit of versatile wardrobe staples. 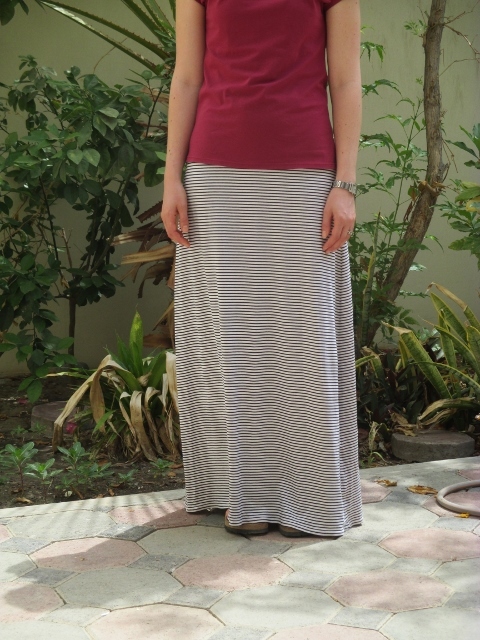 This entry was posted in Dressmaking, Easy beginner pattern, Jersey, Kirsten Kimono Tee, maxi skirt. Bookmark the permalink. Great outfit! I love the Kirsten kimono tee pattern too – I need to make a few to replace some Tshirts that really shouldn’t go another summer! 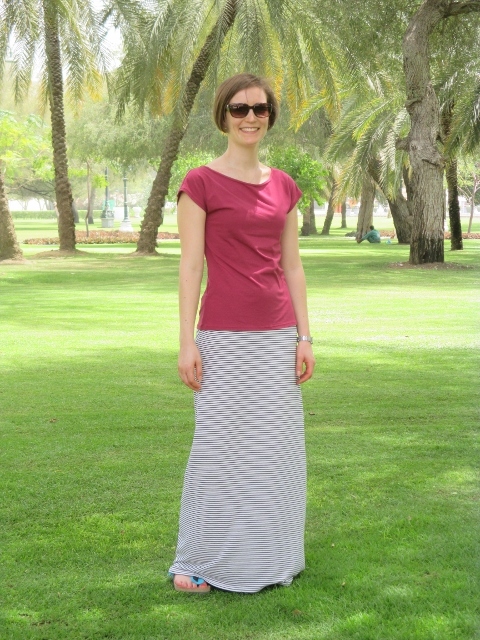 I like the thin stripes of your skirt fabric, perfect wardrobe staples! Isn’t the Kirsten pattern the best? Yes, a T’n’T for me!